With this function, we randomly generate a number within the range of 1-100 and assign the number to the variable numberToGuess. arc4random_uniform(N) is upperbound exclusive (0 - 99) so you need to add 1 to make 1 - 100. The viewDidLoad function is called once when the view controller is loaded onto the app – you could say its the main function of your view controller! Every UIViewController will have this function, so if you have any initial screen setup work to do, do it in viewDidLoad. Now when the application launches, a number will randomly be generated and saved to numberToGuess! 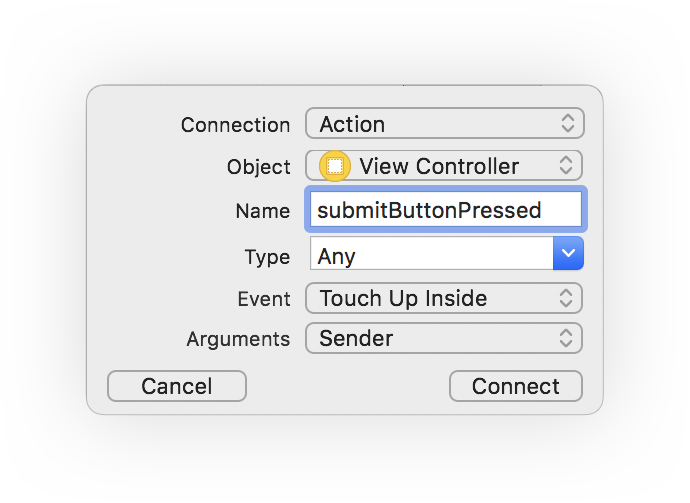 Let’s continue by finally connecting our submit button to the Swift file! An IBOutlet is a connected variable to a UI element. An IBAction is a connected action/function to a UI element. For a button, an IBAction is a function called when the button is pressed on the screen. 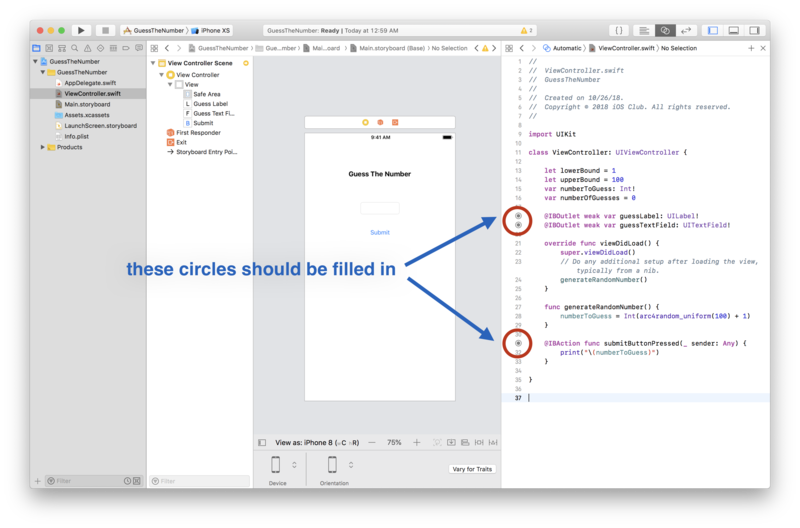 Just like we did for the label and the textfield in Part 2, control-click the button and drag it to ViewController.swift right below everything. In the pop-up screen, change the connection type from Outlet to Action. Go ahead and name the function submitButtonPressed. Run the app press the submit button. Your console should be outputting new randomly generated numbers every time! Dope. Now we have successfully connected our button to our code through an IBAction connection! In the next part, we will work on the logic behind the game!